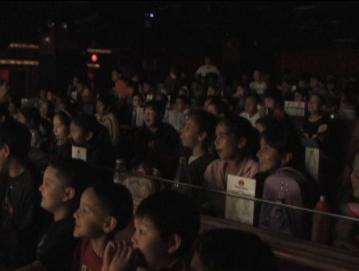 Queens, CT, PA - field trips for school traveling to NYC theater shows. Watch a video clip of our feature on ABC Eyewitness News! advance on any date and time for groups of 20 or more. that can handle larger groups. great theatre as every show uses LOTS of audience volunteers. 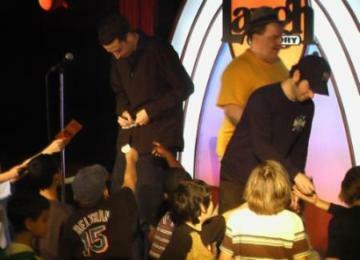 Click HERE to inquire about booking your field trip to see IMPROV 4 Kids! Enough!" is now in it's 8th year and has run professionally off broadway in addition to touring schools and colleges throughout the east coast. NEVER Enough!" has played over 3000 public performances for audiences of all ages in NYC. Bring your class to see one of the funniest most interactive shows in town! Students will learn the art and technique behind improvisation. These skills can help students build self-confidence, leadership and teamwork. needs of your group. Call and ask about resiencies ond other great programs. Broadway, Off-Broadway, TV and/or Film. We also offer lunch show packages or your students can bring a bagged lunch. -Convenient Times Square location is near most subways, busses and a quick drive from the Lincoln and Midtown tunnels. The cast signs autographs for some fans!